On paper, the pairing of Will Ferrell and Mark Wahlberg in a buddy cop action comedy doesn't sound like the smartest move a filmmaker could make. 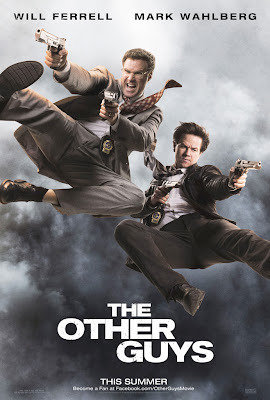 But thanks to the unlikely chemistry between the two leads, and Wahlberg's surprising ability to be funny without over doing it, The Other Guys delivers some pretty good laughs. The testosterone-loaded Wahlberg doesn't pull faces or deliver jokes the way Ferrell does, but when he declares he's a peacock that needs to fly, you've got to wonder why he's been keeping his inner comedian hidden for so long. Over the years I have become quite fond of Wahlberg and his films. He’s definitely the main reason I wanted to see this movie to begin with. Director Adam McKay surrounded Ferrell and Wahlberg with a bunch of scene-stealing guest-spot actors. Michael Keaton is back in the world of comedy, Eva Mendes is the brunt of jok es over her “Plain-Jane” looks, and Samuel L. Jackson and Dwayne Johnson play the two superstar detectives who are given keys to the city even after piling up millions in damages while chasing down a lowly marijuana dealer. McKay busts up cars, buses, storefronts, explodes vehicles and otherwise takes every single action set piece to the extreme, spoofing buddy cop films from decades past with such ridiculous, over-the-top, unbelievable action that there's no chance audiences won't get the joke. And speaking of ridiculous, I felt the plot was unnecessarily complicated for its own good. Still, when The Other Guys focuses on the banter between Ferrell and Wahlberg its shortcomings aren't as noticeable. I felt it was a half an hour too long, and about one third of the jokes miss their mark - they just kind of felt forced or over-the-top to be truly funny. But overall it's better than Ferrell's recent movies and while it’s not the funniest movie I’ve seen - it's not in the same league as Anchorman or Talladega Nights - it definitely has its funny moments. The Other Guys was directed by Adam McKay and is rated PG-13 for crude and sexual content, language, violence and some drug material. Wow a C+? I would have given The Other Guys a C-. Lacked all substance and humor that the other McKay+Ferrell have had.